Past week was the week of bullion stitch experiments. Some worked out and some didn't. I'll show you the first one which turned out quite good. The design is from the book Embroideries from an English Garden by Carol Andrews that I reviewed last week. Though I made changes to the stitching instructions/techniques for my own convenience, the final result did not disappoint. While stitching this design, I noticed another fact about the book that I need to add to the review. The pattern, the instructions and the stitched sample in the book - all of them differ from each other to some extent. If you copy the pattern and refer the stitched sample - the shapes of the leaves may differ. 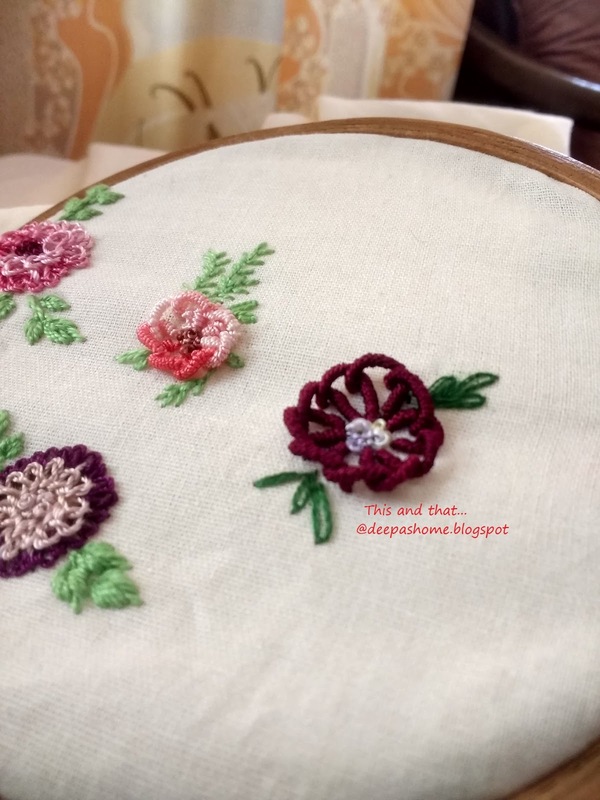 The instruction might have asked to stem stitch, but the stitched sample may have some other stitch.This is probably because the core design is by the author, but the stitched samples are by various embroiderers. 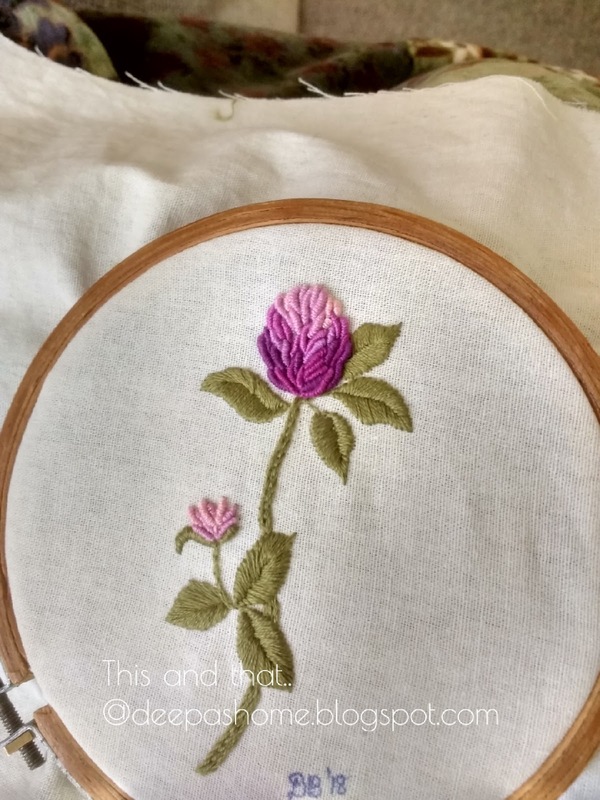 I used about five colors from the 90-100 thread number series from Anchor threads for the flower. The idea was to start with the dark base and move on to the light colors. This piece has been gifted to a friend. Hopefully she'll frame it and send me a pic soon. Now to the next attempt. Over at Rosalie Wakefield's blog, I had come across her trials of the bullion blanket stitch. The idea sounded nice and I tried it twice. In the first attempt the flower turned out to be very small and managing bullions inside the previous stitch so that it looks similar to blanket stitch was very difficult. So I tried a larger version. When I completed it, I found that I like the smaller flower more. The bigger one looked ugly. Anyway, the idea of bullion blanket stitch is simple. Just stitch bullions in such a way that they are placed like the blanket stitch. This weekend we travel back to India. My next post will be from my homeland. Germany has given me a lot of good memories . I will not claim that I am going to terribly miss Deutschland and its people, but I am thankful for the time I got to spend here, to understand the culture, the language and of course for some friendships that I hope will last a life time. I think the large bullion is fine, perhaps just out of place among the others because it is larger and a harder colour. I would imagine in a more modern arrangement it would look lovely. Your larger one makes it easier for us to see how it is formed, too. I expect you are looking forward to being back home. I remember the view from the plane, coming down over all the brown earth and paddy fields.It lifts your heart. And you will have sun! It seems have deserted Scotland at the moment. Safe journey. The scale of stitching is one of my obsessions. Getting the right balance between the thread and the stitch can make a huge difference to the success of it! 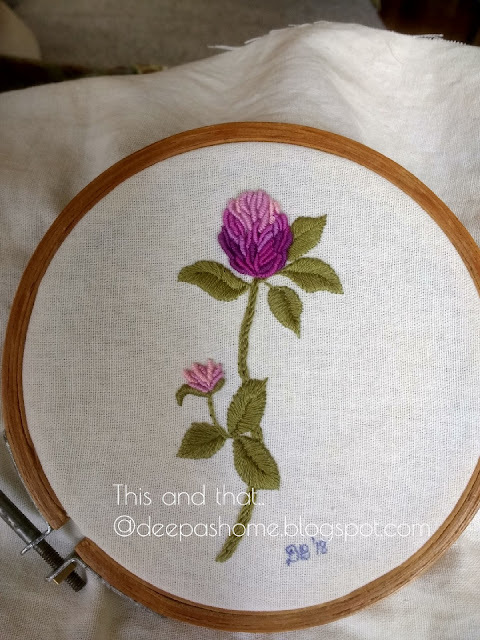 Very very beautiful embroideries Deepa! It is looking beautiful! It has been a long time I tried bullion stitch. I also find that the smaller blanket bullion stitch flower looks more elegant and pretty. You might not like the large Bullion Blanket Stitch, but because of the scale the picture shows clearly how it is made. I like its 3D-look. Have a safe journey back home. I wonder how it would look having a smaller bullion blanket-stitch flower inside of the large one? Like a double rose or double peony? Just a thought. Lovely stitch. Thanks for all the tips and tidbits. Welcome back. Hope to meet you after you settle down. I have to say, that first flower has an incredible number of billions on it! Certainly a way to master them, that's for sure. I quite like bullion knots, but I do know a lot people never stitch them. I think all your flowers are wonderful, I noticed Suz suggested doing another row of smaller bullions inside the larger flower - maybe then you would like it better. Good luck on your move - hopefully it goes smoothly! I presume you are already at home. Thanks for your visitto my blog. We want to see more posts and read "your random thoughts"